Disney Cruise Line revealed some new details about its first new ship in over a decade — the 128,000-ton, 4,000-passenger Disney Dream at a festive show-and-tell today at Guastavino’s in New York City. 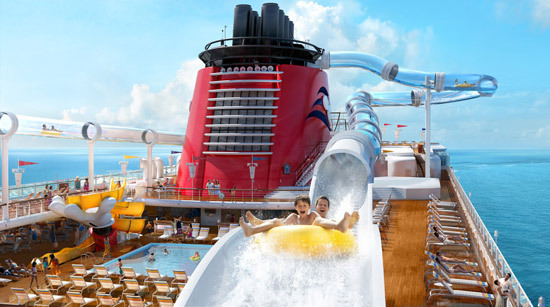 The Disney Dream is full of cruise industry firsts, including the first-ever shipboard water coaster as well as what Disney is calling “Virtual Portholes” which will reside in all inside staterooms and provide a real-time view outside of the ship via a live, high-def feed. Additional features include the opportunity for kids to interact with Crush — an animated sea turtle from “Finding Nemo” — via a 103-inch plasma screen in the Magic Theater; Vibe – a 9,000-square-foot club for teens which will feature an outdoor deck for sunning, with water features and a giant chess board, video games, comfy chairs, each with its own iPod station, and a dance floor; Andy’s Room, a new addition to the Oceaneer Club where kids will experience being “toy sized” in this space with its gigantic features, from larger-than-life characters (including a working Mr. Potato Head doll) to an oversized, remote-control racecar (get behind the wheel! ); plus much more. But rather than write about the fantastic amenities the Disney Dream will provide, check out the following video tours that Disney Parks has put together – the first providing a sneak peak into the cruise liner’s features and amenities and the second providing a virtual ride thru the first ever water coaster aboard a ship.